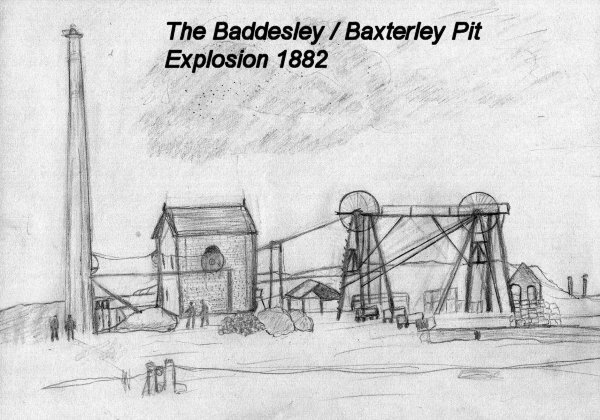 Welcome to The Baddesley Pit Explosion site. Baddesley Ensor is a small rural village in North Warwickshire, in the heart of England. Coal mining was carried out here for centuries before the two main shafts of Baddesley /Baxterley Pit or Stratford Pits, as it was originally known, were first sunk in 1850. It was owned by the Dugdale family of nearby Merevale Hall until nationalisation in 1948. It closed in 1989. The disaster of 1882 was the worst in its history when 32 men lost their lives. I have been researching this disaster for some years as four of the men who died were my ancestors and another, Charles Day, who was my great grandfather, was awarded the Albert Medal for his part in the rescue attempt. I have written my own account of what happened based on newspaper reports of the time and the Morley report. Arnold Morley was an MP who carried investigations into the causes of the disaster. I have also included an account written by my son as his dissertation for his English Studies degree from Huddersfield University in 2001. Finally I would like to dedicate this site to the memory of all the men who died and also the other men who risked their lives in the rescue attempt and who survived. Updated and expanded August 2013. The Definitive book of the disaster. Now out of print - working on a new expanded version. Map showing the location of Baddesley Pit.